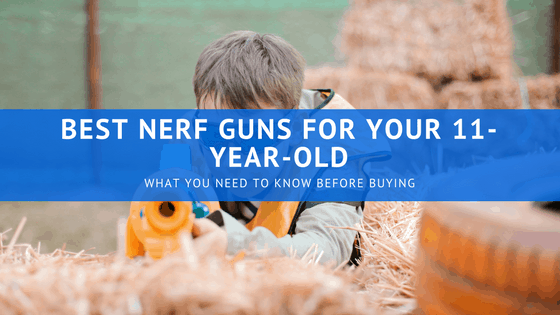 If your child already has Nerf battles with you or their friends, you’ve probably heard about how frustrating it can be to work with a gun that has low ammo capacity. They constantly need to be reloaded by hand and it becomes less fun when kids have to stop playing and reload every 30 seconds. To avoid this, choose a gun that has high ammo capacity and needs to be reloaded less frequently. You can seek out a gun that uses clips so that it’s easy and quick to reload; clips can be preloaded and kept on hand for when their ammo runs out. However, keep in mind that these types of qualities and accessories may or may not come along with an expensive price tag. How a gun looks and how a gun is designed is just as important to older kids as how many bullets it can hold or how well it fires. Nerf guns come in a lot of different colors and styles, so there are plenty of options to choose from. For example, some of the styles that you can currently choose from include Nerf Zombies, Nerf Rebelle, and Nerf Doomlands. When it comes to design, there are several models of guns that can be modified to carry extra ammo, sights, and other accessories. The best part is that these type of accessories and modifications can either be made by Nerf or by a third party to fit existing Nerf models. If your 11-year-old is really into Nerf, the way that their gun is designed is important. While it might not seem like a big deal, the type of ammunition that is used by the gun that you will purchase for you child is important. Some Nerf guns are designed to work only with certain types of bullets, rendering them incompatible with other models. Make sure that you research a gun and its type of ammunition before you purchase it. If you purchase a gun that can only shoot elite darts but your child wants to be able to shoot older velcro rounds or foam balls at their friends, you are going to end up having to purchase another gun. On that note, it is probably best that you purchase a gun that can handle more of the modern rounds. Special ammunition can become expensive quick, especially if your child is prone to losing bullets or destroying them. Buying a gun that handles normal bullets will still cost you but it will be less than purchasing packs of custom bullets. There are Nerf guns that can only shoot a bullet up to five feet and there are others that can shoot a bullet up to 90 feet while still managing to hit the target with force. It is more than likely that your child will want a gun that can do the latter. Search for a gun that can spit out a decent amount of bullets at once and hit a target far away in an indoor environment as well as an outdoor environment. Nerf has all kinds of guns that range from skinny to large that meet these two requirements. If your child is looking for mostly range and doesn’t care about bullet type, you should look into the Nerf guns that shoot foam balls. These types of guns are typically both far range and powerful. Your child may think that bigger is better but they will soon realize that it is no fun to carry around a 7-pound Nerf gun all day. Besides this, the goliath Nerf guns have a tendency to eat away at batteries and require so much reloading that it can become frustrating quickly. Instead, look for a Nerf gun that can meet all of the requirements above while still being a size that your child is capable of handling. You don’t want to purchase a gun for them that will be so heavy that they will never use it again. The first gun on this list manages to meet all of the requirements listed in the buyer’s guide. While the capabilities of the Nerf N-Strike Elite HyperFire Blaster are impressive, there are some complications that should be mentioned. The first one is that this gun requires four D batteries in order to operate. This wouldn’t be a problem if it weren’t for the fact that D batteries are quite heavy and this gun is known to go through batteries quickly. The second problem is that this gun has been rumored to jam and there is no way to reach in and fix the gun because it is designed to prevent you from getting inside and fixing it. However, these issues shouldn’t prevent you from looking into this gun as an option for your 11-year-old. 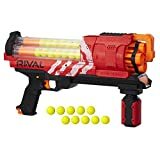 The Nerf Rival Artemis XVII-3000 separates itself from the rest of the blasters that Nerf has made because it uses high-impact foam ball rounds rather than regular bullets. 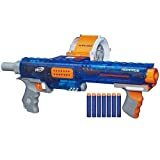 Besides this change in ammunition, the Nerf Rival Artemis XVII-3000 is able to launch its high-impact rounds at 100 feet per second, has a rotating barrel that can carry up to 30 of these rounds, and uses a pump cocking mechanism to prepare each round for firing. 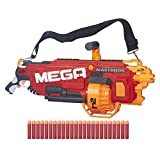 Frankly, this is a great Nerf blaster that should be considered when you start looking for a Nerf gun for your 11-year-old. It’s fast, easy to reload, can hold a lot of ammunition, and only costs around $30. There is also very few complaints and the blaster itself seems to be perfect. The best part? This version of the gun is an upgrade from the previous one. If this one is a little outside your budget, you can purchase a simpler version for $10 less. The Nerf Modulus Regulator, although thinner and smaller than some of the Nerf blasters known for their capacities and accessories, is a monster in its own right. The Nerf Modulus Regulator, unlike many other blasters, gives you the ability to choose from three different firing options: single-fire shooting, burst-fire shooting, and continuous-fire shooting. The blaster can shoot up to 12 bullets at a time, which are stored in an ammo clip, and can carry another 12-bullet clip in the storage stock of the weapon. Along with these features, the blaster also has a swivel handle at the front that can be held onto for better accuracy, two different attachable barrel scopes, and an indicator that lets you know when you have run out of bullets to fire. There are a few downsides but they are only minor inconveniences at best. This blaster requires four C batteries in order to operate, which can be costly over time if the gun uses batteries quickly. The weapon is also fairly expensive, ringing in at around $60. 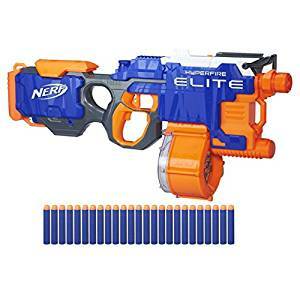 The Nerf N-Strike Elite Rampage Sonic Ice Series Blaster is perfect for those who are looking for a blaster with a large ammo capacity without having to deal with the hassle of electronics. 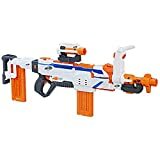 Much like the Nerf N-Strike Elite HyperFire Blaster, the Nerf N-Strike Elite Rampage Sonic Ice Series Blaster has a drum that is able to hold up to 25 Nerf darts. Unlike the first gun, however, this blaster uses a pump cocking mechanism rather than batteries to launch the darts. This blaster is capable of shooting darts up to 75 feet. There are not too many downsides about this blaster except for the price. This gun is priced at around $60, which is a little high for a pump-action gun. Still, it is said to hold up fairly well and, considering its capacity, this is a good gun if your 11-year-old intends on using it frequently. The Nerf N-Strike Mega Mega Mastodon is aptly named because of its monstrous size. 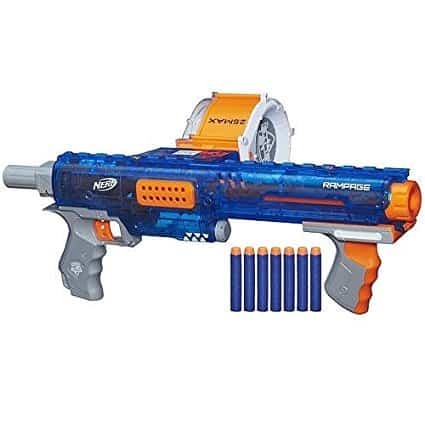 This blaster comes equipped with 24 mega whistling darts, has a drum that is motorized and capable of holding 24 mega darts that can fly up to 100 feet, includes a handle, strap, and other equipment to assist you in keeping the gun pointed up. This gun is quite heavy, partially because of the six D batteries that are required to operate it, and should only be handled by those who don’t mind carrying the mastodon around on their shoulders. Also, this gun runs for around $70. Out of all of the guns listed above, we recommend the Nerf Modulus Regulator. Even though the price is a little higher than some of the other guns on the top-five list, the ammo capacity, the accessories included with the gun, and the firing options make it a steal. However, if you’re on a budget but you still want a high-quality gun and your 11-year-old doesn’t care about ammo, you should purchase the Nerf Rival Artemis XVII-3000. If you’ve liked any of the guns recommended on this list, you can purchase them by clicking on the links below.